You may have been following the story on Facebook of the solar powered fridge that was purchased for the Liwolo Clinic. We felt it only fitting to share the story in full, to give you a flavour of the difficulties faced by the people of South Sudan on a daily basis. We hope you enjoy the account by Joseph Abba. 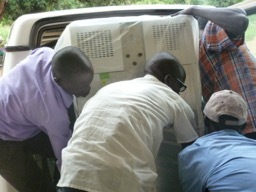 There was a dire need at the Liwolo Clinic for a fridge to store medicine and lab equipment. CRESS responded to this need and purchased a solar fridge! It was agreed to be sent through Entebbe, in Uganda and Patrick our trusted friend and taxi driver was to clear, collect and deliver it to Namirembe Guest House (NGH) for collection by me (Joseph). This is all sounding very simple don’t you think? Joseph continues …. The goods reached Uganda on the night of April 13th and clearance was completed on 16th around 3pm. There were difficulties in sending money through Western Union and it took a couple of days for CEO (Caroline Lamb) of CRESSUK to succeed in sending the money through Moneygram. The fridge and the safe (required for the office) were loaded to KAMIZA MUKENYE TOUR AND TRAVEL car and started their journey from Kampala at 5pm …. unfortunately at 7:42pm the car broke down! A mechanic was eventually found and we had no choice but to pay the money he demanded and at 12:28pm the journey began again. Until 2am when it broke down again in a town called Kamadini where we stayed the night and following repairs in the morning we did manage to leave at 9am, only to break down just 45 minutes later. At 1pm the car was once again declared well by a mechanic and we took off for Moyo through Gulu arriving in Moyo Town at 5:30pm – what a joy. Goods were then transferred to another car, which was not easy with the safe weighing 800kg plus. I had to hire a good number of loaders to transfer the safe and fridge. Further difficulties in Moyo due to problems with the exemption letter that is written by the Diocesan! Every Wednesday is a diocesan leadership meeting. Emmanuel and Diocesan secretary were very reluctant to write the exemption letter because most of their letters sent to customs were not honoured. The protocol demanded that the Diocese should apply for the exemption too the Ministry of Internal Affairs, Directorate of Custom and clearance in Juba. I insisted for the letter and drafted the exemption letter myself for signature. I had to send one of the drivers with my motorbike to pick up the key which was with Golda and by now was getting really impatient, I needed to finish the clearance and the driver was still calling every 5 minutes. It was brought after one hour. I could sit in my office, turn off the phone and try to pray “why me O God”. With the key in hand I printed the letter and took it to Diocesan Secretary for signing and ran to Jale border. Only 2 kilometres from the office, my fuel ran out and I had no money, Emmanuel was not in the office and I had to push the motorcycle to next petrol station and able only to fill with a few litres. I asked the driver to leave us alone. I prayed in my heart quietly for wisdom and favour. After minutes of silence, I told him that “you and I are servant of our people. We are concern of their flight, health and welfare. That is why you are here and left you children and family far away. So do I. we are offering ourselves as sacrifice for this nation and the people of South Sudan. These are equipment for South Sudan and for the people of South Sudan. They are not mine neither for the church nor the organisation I am representing. You are here to raise money for the people of South Sudan. This issue is now between you and me. I do not want to go any further. I do not have the money you are demanding. We request good wisher to help the people of South Sudan with this equipment and it is unfair for us again to ask them for more money of clearance. Use your power and mandate to save the people of South Sudan and in particular the people of Liwolo. I knew whether you gave us the exemption or not we have to pay something.” I dip my hand into my pocket and pull out all the money I got in his eyes. I told him I loan this money from a businessman, Yabadarakita. “Do you know him?” He answered “yes, I do”. He kept quiet for a while. “Let us confirmed this money together and told me, “you can go”. A joy overflow inside me that I could not imagine. I came out of his office and order the driver to start the engine. “Have you finished clearance?”, ‘yes’ I told him, “I have finished”. He couldn’t believe. He told me there are two more offices remaining. We were cleared with word of mouth. It was a real Joy. My stress and frustration was gone. I jump on my motorbike with songs of praise and repentance for fighting God. I told God, I am more willing to be used by you more. It is exciting work with God not for God. CRESS was able to save $800. On Saturday, 23rd April, we delivered the fridge to Liwolo and installation started on Sunday and completed on Monday 25th. 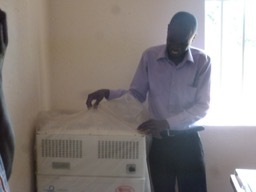 The head of CRESS South Sudan confirmed the installation on 27th and office cleared the technician on 28th, April.